Stewart rushed for 2890 yards in college, with 1028 as a senior in 1994, and also gained another 463 yards on 54 pass receptions while scoring a total of 39 touchdowns. 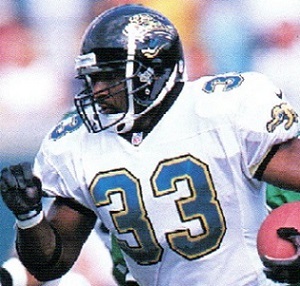 He was chosen by the expansion Jaguars in the first round of the 1995 NFL draft (19th overall), who were attracted by his ability to catch out of the backfield as well as his size and speed. Struggling early, he led the club with 525 rushing yards as a rookie. Stewart performed well in 1996 before a toe injury sidelined him late in the season, after gaining 723 yards on the ground, catching 30 passes, and scoring 10 touchdowns. He was primarily a backup to veteran RB Natrone Means in ’97, although he accumulated 555 rushing yards and 336 more on 41 catches, and had a five-touchdown performance against the Eagles. A knee injury cost him all but the first three games of the 1998 season and hastened the emergence of rookie RB Fred Taylor, which again put Stewart in a backup role heading into ’99, but an injury to Taylor put him back in the lineup. Jaguars went 14-2 to finish first in the AFC Central while leading the conference in rushing yards (2091). Won AFC Divisional playoff over Miami Dolphins (62-7). Lost AFC Championship to Tennessee Titans (33-14). With Fred Taylor expected to regain the starting job, Stewart signed with the Detroit Lions as a free agent in 2000. He rushed for 1184 yards and 10 touchdowns, although averaging only 3.5 yards-per-carry. While the average improved to 4.8 yards in 2001, Stewart appeared in only 11 games due to ankle problems. In 2002, he gained 1021 yards and caught a career-high 46 passes for 333 yards, but a shoulder injury suffered during the ’03 preseason finished his career. Overall, Stewart rushed for 5841 yards on 1478 carries (4.0 avg.) and caught 220 passes for 1715 yards, scoring a total of 57 touchdowns. Of that, 2951 rushing yards and 853 receiving yards on 119 receptions came with the Jaguars, as well as 38 of the TDs.